Pirate is essentially a two-person solitaire game, because the two players basically play their own games and only interact at certain points in the game. Gameplay is quite simple, making it a great game for children. The object of Pirate is to capture more ships (sequences from king down to ace or vice-versa) than your opponent. Pirate requires two standard 52-card decks of playing cards. The two decks are not intermixed, at least initially, and it doesn’t matter if their backs are different. 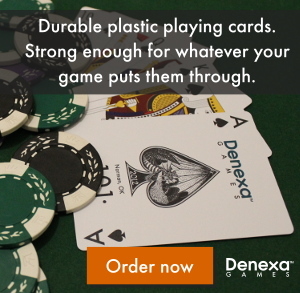 A two-deck set of Denexa 100% Plastic Playing Cards will fit the bill perfectly. 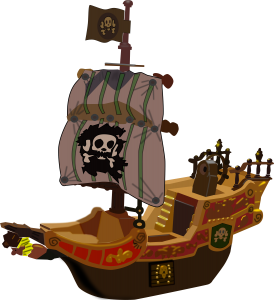 Because there are no turns in Pirate, with players making their plays simultaneously, cards can unintentionally get bent, meaning that the added durability of plastic cards will be handy. 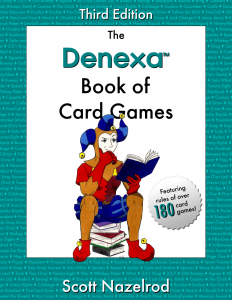 Each player shuffles the other’s deck, and then cuts their own deck, exposing the bottom card of the top half of their deck. The player with the lower exposed card is the low player and the other player is the high player. Players then shuffle their own decks, each deck forming their own personal stock, which they keep held in their hand. Players begin turning cards face up from their deck into a face-up waste pile. When the low player encounters an ace, they place it in front of them as the keel to a new ship. Likewise, the high player may lay a keel to a new ship with a king. New keels are placed across the table from a keel of the same suit on the opponent’s side, if there is one. Upon these keels, players may build upon their own ship with cards of the same suit, in sequence, with the low player building up from the ace and the high player building down from the king. Players may not play to their opponent’s ship. When the stock is exhausted, the waste pile is turned face down to form a new stock. When two ships meet up to form one uninterrupted 13-card sequence, the ship is captured by the player that played the card that connected them, and the ship is squared up and put aside next to the capturing player to be scored later. If, however, both players attempt to capture the ship at the same time, it is sunk and the entire ship is discarded, with no score being awarded to either player. After a ship has been captured or sunk, a new ship of that suit is built, with the players laying the opposite keels as before—the high player lays the ace and the low player lays the king. When a player exhausts both their stock and waste pile, they cease normal play, but continue to observe their opponent. If the opponent draws any cards that the observing player could use to build upon their own ships, they may claim the cards as their own, provided they do so before the opponent plays the card or draws another. If a card is drawn that would capture a ship, the first player to claim it gets the capture—or, if both players claim it simultaneously, the ship is sunk. The first player to capture five ships—or four, if a ship has been sunk—is the winner.